Shortage of liberties is an acute lack of liberties. 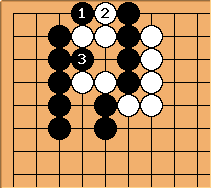 The player suffering from shortage of liberties is unable to achieve a desired objective because to achieve that objective, he will eventually need to play some move that is self-atari or suicide. 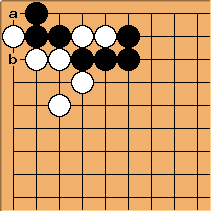 As a first example, Black would like to play a here to make two eyes, but his string of stones would then be in atari, his only liberty being Therefore after Black plays at a White can capture his whole string by playing at . In both situations, the eyeshape is the same, but the shortage of liberties changes the status. Therefore, don't take away your own liberties without a good reason. When a stone has only one liberty, it is said to be in atari. When a group has few liberties, it can be called short of liberties but it is simpler to say that it has not enough liberties. In a race to capture, the losing side does not have enough liberties, but because that is a given, it is not put in those terms. So, there must be a certain objective which superficially, shapewise, normally would be possible but in this particular case is not, due to the shortage of liberties. Even then, not all situations where one is short of liberties for a certain objective, would be called damezumari. Here, White would normally be able to play atari at a but due to the special properties of the corner, in particular the fact that the corner point has only two neighbors, he cannot play a and must play an approach move at b first. This is called connect and die or external liberty shortage by Robert Jasiek. It can occur, e.g, in connection or endgame tactics. The bamboo joint may be short of liberties. 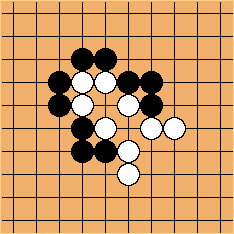 Black would like to split White's groups but cannot, due to shortage of liberties. This oshi-tsubushi relies on a suicide. Other instances rely on self-atari or a missing possibility to escape from atari. The book Life and Death Problems 1.